Prague is the capital and largest city in the Czech Republic. It is a very well preserved city with an impressive Old Town. Many hostels are centered in or around the Old Town area, which is where you'll find most of the city's sights and attractions. Many hostels also offer a variety of amenities including good food, various group activities, and on-site bars. Hostels are a great option for travelers who want a social environment where it's easy to meet other guests. If you're looking for a social place to stay in Prague, then you don't have to look past Hostel One Home. It's located about a ten minute walk from the Old Town Square, right in the historic heart of the city. It's within walking distance to any of the attractions you might want to visit and it's just one street away from the Powder Tower. The hostel is run by travelers, and they enjoy having fun just as much as you do. They can help you with any advice or recommendations while you're in town. They also host a group dinner every night. The meal is free and delicious! It's the perfect time to hang out with other guests and swap travel stories. In addition to the group dinner, there is a free breakfast served every morning. There are also all of the standard amenities available including free wi-fi, luggage storage, lockers, and a comfortable setting. The hostel has five common rooms that you can relax in. These include the shared kitchen, a movie room, a lounge, a computer room, and the terrace. This hostel is specifically designed for solo travelers or small groups of friends (less than six people), who want to hang out and get to know each other. They do not accept large groups. Dorms range in size and include four bed, six bed, eight bed, and ten bed rooms. Hostel DownTown is another fun option that's located right in the heart of historic Prague. The hostel is within walking distance to many of the area's top sights and attractions. It's a five minute walk from Wenceslas Square and is just five minutes from the Charles Bridge. This is a fun place to stay if you want to meet other guests. They regularly host events for guests including group dinners, walking tours, and pub crawls. They also offer several great amenities including wi-fi throughout, luggage storage, and any travel information that you might need. Breakfast is available at an extra charge. There are several great common areas including a shared kitchen and a television lounge. This hostel has a range of rooms available from twins to ten bed rooms. Both shared and private bathrooms are available. Dorms sleep up to eight people and you can choose from female only or co-ed. If you're looking for a smaller hostel with a lot of character, then this is the place for you. 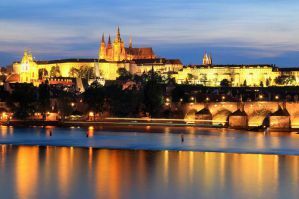 It's located in the historic heart of Prague, right on the Charles Bridge. It's just a couple of minutes away from anything that you might want to see or do in the area. The hostel has been fully renovated and it offers unique, fully furnished apartments. Many apartments have their own kitchen and television. Deluxe rooms also have a private bathroom and dvd player. There are also more affordable rooms that share the group kitchen. There's a tourist information office downstairs if you need any help planning your stay. They can offer all kinds of insight into Prague's history, culture, transportation, and more. They can also help you book any excursions you might want to do. Sophie's Hostel has the feel of a hotel for the price of a hostel. It's a very clean and comfortable place to stay with simple, but well decorated rooms. It's actually located in Prague's New Town, and is a short metro right into the Old Town. It's located away from the most touristy areas so it's surrounded by many great local restaurants where you can enjoy delicious and authentic Czech food for a reasonable price. The hostel has the feel of a boutique hotel. It's located in two historic buildings that have a modern interior. There's a guest kitchen available and breakfast is served every morning (for an additional fee). The staff are friendly and helpful and can offer all kinds of travel suggestions. If you want to stay in a convenient location, but don't want to be in the midst of the tourist crowds, then this is a great option. It will show you a more authentic side to Prague. Private rooms are available that sleep between two and five people, and everything in between. All private rooms have private bathrooms. Dorms sleep five, six, or ten people and female only rooms are available.